With the average cost of one and two bedroom apartments soaring over $3000 a month, seniors, the disabled, low-wage workers and young families are being driven out of Silicon Valley. Evictions are on the rise, as rent increases burden a larger and larger portion of the population. There is a lot of new home construction happening in Silicon Valley, but practically none of it is affordable to vulnerable renters. Instead of getting below market rate units, local communities are seeing the rise of “upscale housing” for young tech workers. Something has to give. According to local activists who are working on behalf of threatened renters, the “something” that has to give is greedy landlords, not workers. For this month’s Other Voices Forum, we’ll take an in-depth look at the frightening housing situation in our neighborhoods and the activists who are organizing a determined opposition to it. They and others are calling for a moratorium on new rent increases, rent control, eviction law reform and the construction of much, much more affordable housing. Their movement — quite understandably — is growing. 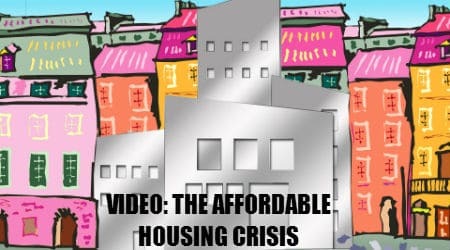 This entry was posted in Videos and tagged Affordable Housing by PPJC Admin2. Bookmark the permalink.